It’s a dreary, rainy Good Friday. 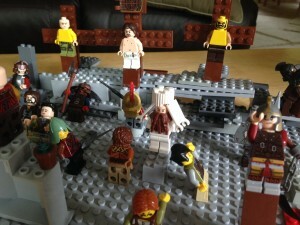 The boys are busy this morning putting together a Lego scene of the crucifixion. That probably sounds morbid, but it’s really not like that. 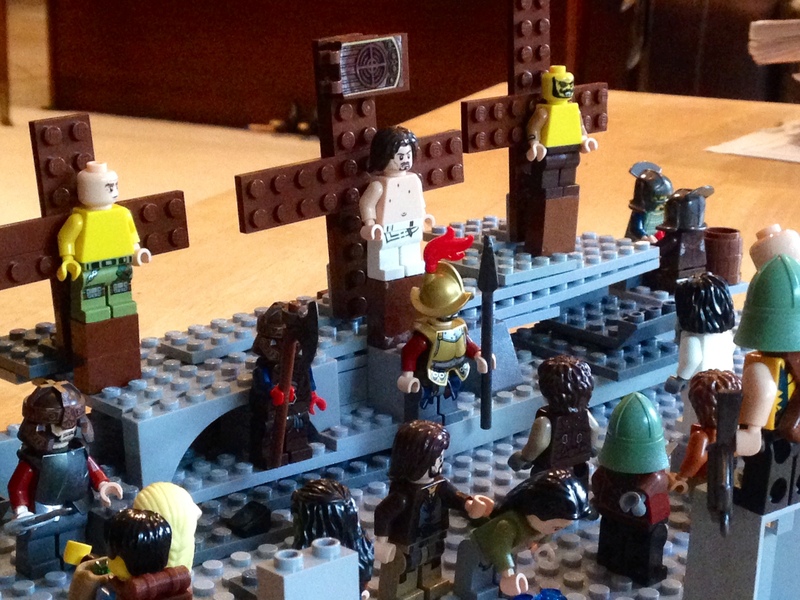 It’s a hands-on activity where they use their impressive Lego skills to portray everything they’ve learned through our Lenten lessons. There’s a lot going on in the scene. I took a short video while Gray described all the different things they included. While they worked on this, I cooked up a pile of italian seasoned ground beef, and half of it is now in the crockpot with lots of tomatoes and sauce, where it will become spaghetti sauce for dinner tonight. The other half is going into the freezer for the next time spaghetti is on the menu. As I was saying in my previous post, unfortunately, that was probably my chore of the day. It used way too many “spoons”, if you’re familiar with that analogy (if you’re not, look up “the spoon theory”). Also in my last post, I said I’d spent the past weeks doing as much potting, re-potting, and gardening as my body would allow each day. What exactly was I doing? Well, the first week I spent re-potting all my plants and sprucing them up for the season. Between outdoor and indoor plants, I had 23 in all! After spending a long, cold winter sitting in the garage, the outdoor plants were ragged, tired, and in dire need of pruning and refreshing. The indoor plants were overgrown and tired looking. When I re-pot, I prune the roots first. Then I re-pot with new soil. I always use a mixture of 2/3 potting mix with 1/3 sand from our back yard. It helps immensely with drainage, and my plants thrive in it, so I think it’s perfect. Finally, I prune off all the dead or spindly growth, which usually amounts to over half the plant being pruned away. But that helps them to thrive, because within a couple of weeks of this hard pruning, my plants are putting out all kinds of new growth, and those that flower are popping out their first flowers of the season. With all the pruning, I end up with piles of cuttings. I used to stick some of my cuttings into more potting soil and start new plants, but at this point I have all I can handle, so I now give the cuttings away. Frustratingly, none of my local friends or neighbors care much for growing things, so after my cuttings being turned down one too many times, I started posting a craigslist ad in the “free” section whenever I prune, and within an hour I have people fighting to come get my free cuttings. The upside is I’ve met some nice local people who do enjoy growing things, and they really appreciate the cuttings, so I know they’re going to a good home. It’s win-win. I do the same thing in the summertime when my herbs are producing way more than we can use or freeze. While I was doing all this hard work, I had Philip building me a small veggie garden bed off of our back patio. He did a great job doing all the difficult mathematical figuring and getting the brick border level and plumb (who knew building a garden bed requires geometry? Since I don’t acknowledge math beyond a 7th grade level , I’m very appreciative of his higher math skills!). He then amended our native soil with manure and mushroom compost, and chopped up lots of leaves for the top layer of mulch. I planted a grape tomato plant, two heirloom summer squash plants, and a lot of herbs: basil, oregano (used to season the spaghetti this morning! ), two types of thyme, sage, parsley, and chives. My rosemary plant from last year is huge and thriving, and is just outside the bed. The squash and tomato plants have grown in size and are beginning to set flowers, so hopefully healthy fruit will be next. I have a few feet of space left in the bed and am waiting on warmer weather before I plant speckled butter beans. We’re going to use concrete reinforcement mesh as a trellis. I’m going to get two panels and a-frame them, and plant the beans on either side so they can climb up. I also got some heirloom sugar baby watermelon seeds, but because of the way our yard is engineered, I have to plant that off of our lawn area, so I’ve got a spot reserved for it in a lawnless area. I’m going to grow them in a pile of manure & compost…I’m just waiting on warmer weather for that, also. We’ve had an unusually cool spring. Even now, in mid-April at noon, it’s only 58 degrees. Normally we’re in the 80s by now. In addition to my garden bed herbs, I got a mint plant this year. It’s too aggressive to be planted in the ground or bed, so I planted it in a terra cotta window box. I got it for the boys, because both of them are crazy about peppermints, and I thought they’d enjoy picking a leaf off here & there for a treat. I was right, too. They can’t keep their hands off of it. I also got some ever-bearing strawberry plants, and planted them in a strawberry pot that I got via freecycle. We all love strawberries and can never get enough of them, but they never have local strawberries anymore in our markets, so I’m hoping these work out. So far, so good. They’ve tripled in size and are starting to put out their first flowers. Lastly, I planned and planted a hummingbird and butterfly garden. I’ll talk more about that in an upcoming post, and share pictures. Also, while all this craziness was going on, we had a landscaping contractor doing work on our yard (we have serious drainage issues…never build on a hill, folks), planting trees (we got two Live Oaks and two River Birches), and installing raised foundation beds along the front and side of our house. This is a huge project, and the foundation beds are something I’ve been waiting to get ever since we built the house five years ago. I’ll share how that’s going in another post, also (teaser: it’s been a disaster due to their poor setup and workmanship, and we’re still trying to get the contractors to sort it all out). For now, I’ll leave you with my wishes for a blessed and meaningful Good Friday and upcoming Resurrection Sunday! Spring! Resurrection Day is approaching! Here I sit catching my breath. It’s what I have to do often throughout the day, in order to be able to do anything at all. I feel indescribably sick all the time, but the feeling is at its mildest in the mornings (usually. Sometimes I get an unpleasant surprise and it’s actually worse in the mornings), so mornings are when I try to get as much done as I can. If there’s a chore that requires a good bit of energy, it zaps me completely, leaving me weak and feeling very ill. So I only have the strength for one big chore each day. For instance, if I’m going to be the one to cook dinner that night (Philip usually has to cook, but he can only do simple things), I have to choose that as my “thing I’ll get done today”, and I do all the prep in the morning. This morning, Philip had a meeting in Pensacola (big new client! Great news! ), and while there he got some important errands done, so I was alone with the boys through lunch. The first thing we did was go outside and I got them started on a Good Friday nature walk. I know today isn’t Good Friday, but I have something else planned for that tomorrow, so I decided to have them do the nature walk today. They had to find six nature items relating to the days leading up to Jesus’ arrest, crucifixion, and resurrection, and then draw them. 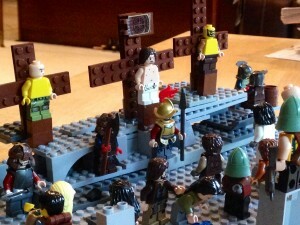 The items were: A palm leaf (entry into Jerusalem), thorns (the crown of thorns), sweet or spicy scented plant (spices used to cover his body), large rock (the stone at his tomb), and an example of new life (resurrection). They also had to choose & identify a tree and do a bark rubbing of a cross. They enjoyed it and both of them actually said it helped them to reflect on these different aspects of Jesus’ last days & resurrection, so…mission accomplished! So as I mentioned, I got them outside with their clipboards and started them off by making sure Des knew how to do a bark rubbing. Then I set them off to do the rest of the “hunt” on their own. Not surprisingly, they went into the woods to find most of the items. While they were doing that, I gathered clothes to wash and got that started, and then I started working on cooking. Eventually, the boys came back and we went over their findings, and then they had a snack while I finished my recipe. Gray helped me clean the kitchen counters and put things up, and then he swept the floors for me because when I was refilling the sugar canister, a huge clump came out and shattered, spraying sugar all over the place. He knew I was at the end of my morning strength, so he came to my rescue, as he always does. He also helped get his and Des’ lunch ready, which is something he does for me whenever Philip isn’t home or is too busy to help. He’s learning to be a good man! Now Philip is back, and I collapsed onto the couch, where I’ll stay until I feel well enough to get up and do something else. And so go all of my days, for the past year or so. It sounds bad, and it is in many ways, but after the year before last, which I spent completely bedridden, I can’t complain too much. I’m thankful I can be up and do anything at all! The boys are still on their Spring break, since the weather is still so nice. I have G doing math and Des doing Phonics each day still, to make sure we don’t fall behind in those crucial subjects. During this break, I worked very hard each day to get my planting and gardening done for the spring. I can only work in short bursts- maybe an hour or two outside, tops, and then I have to go inside, guzzle water, and rest for at least 30 minutes to an hour. Then I can go back outside and work for another hour or so, then back inside. Lather, rinse, repeat. I did this each day until it got dark. And I’m finally (mostly) finished. What exactly was I doing outside? Well, I’ll do a separate post about that.